Our view is that any trainee whether novice or long served industry professional should be impressed by our instructors and feel empowered to make consistently safe and efficient choices throughout their career, based on current industry best practice, that is much deeper and wider than the City and Guils schedule. But what are the qualities and skills required to deliver chainsaw training and other forestry and arboricultural related skills? This is self evident - the instructor needs to have the skills to demonstrate and to be able to break them down into manageable chunks. This is more than just having the same unit qualification they are instructing. In the case of Lantra Awards Approved Instructors this comes via a three part process: preliminary interview, one to one technical evaluation and then a technical standards course. The instructor should hold more technical or follow on skills and knowledge. 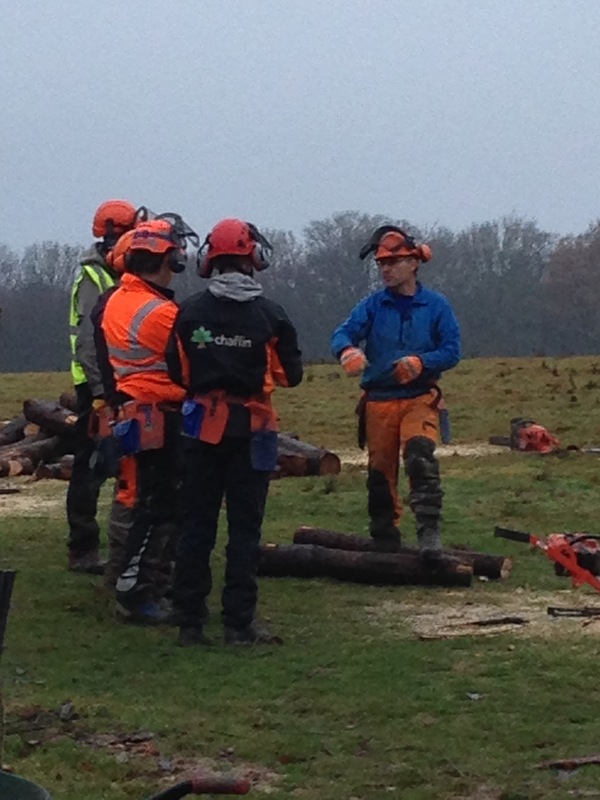 This helps to put the skills they are delivering within a wider industry context, for example a chainsaw instructor may choose to discuss and show more advanced techniques to a trainee that is getting on well on a more basic course, or an instructor with Forest Machine Operation knowledge and qualifications will be in a better position to discuss site layout and organisation for timber extraction, roadside timber sales and market opportunities, rather than just how to operate the machine. The separation of the skills into separate City and Guilds units isn't 'real', when viewed from a forestry and arb perspective - context is needed. An accademic qualification or professional body accreditation is essential - tree care involves more than just cutting them down. It's everything from choosing the right tree for the environment, planting and caring for it, and being able to do all that within the legislative framewrk and following industry good practice. Credible instructors have a strong commercial background in forestry and arboriculture - they have actually earned a living from many years working with trees. How can you relate to people who are planning to work in the industry, if you haven't experienced it yourself? Within the Lantra Awards system, instructors are subject to standard setting and regular monitoring visits and have had formalised training in instructional techniques, including learning and teaching styles, delievered to a national standard within a quality assured system. It is good practice to continue your professional development in order to remain up to date with equipment, resources, techniques and industry good practice. The Institute of Chartered Foresters recommends 100 hours of formalised CPD within a three year period. A good instructor will be actively involved in the industry, for example via discussion groups, presenting workshops, writing articles and getting involved in industry consultation. Any insurance is based on full disclosure of material facts. All the above would support relevant insurance for instruction, professional indemnity, public liability and employers liability. It is a privilege being an instructor. We have met and am sure will continue to meet some amazing people.